in partnership with the Idaho Department of Water Resources (IDWR) and Idaho Water Resource Board (IWRB), we will construct a numerical groundwater-flow model of the Treasure Valley and surrounding area. Resource managers will use the model to simulate potential anthropogenic and climatic effects on groundwater for water-supply planning and management. As part of model construction, the hydrogeologic understanding of the aquifer system will be updated with information collected during the last two decades, as well as new data collected for the study. 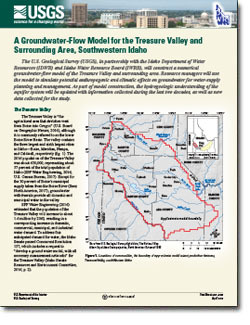 Bartolino, J.R., and Vincent, Sean, 2017, A groundwater-flow model for the Treasure Valley and surrounding area, southwestern Idaho: U.S. Geological Survey Fact Sheet 2017-3027, 4 p., https://doi.org/10.3133/fs20173027. To begin filling data gaps for model development, we installed 10 new real-time streamgage on drains along the lower Boise River from Eagle to Parma. The streamgages will monitor the amount of shallow groundwater the aquifer system discharges to surface water. This was a missing component in previously developed models.